Owner Kevin Kurland (right) with ather Frank Kurland Sr. (middle) and uncle Ken Kurland. 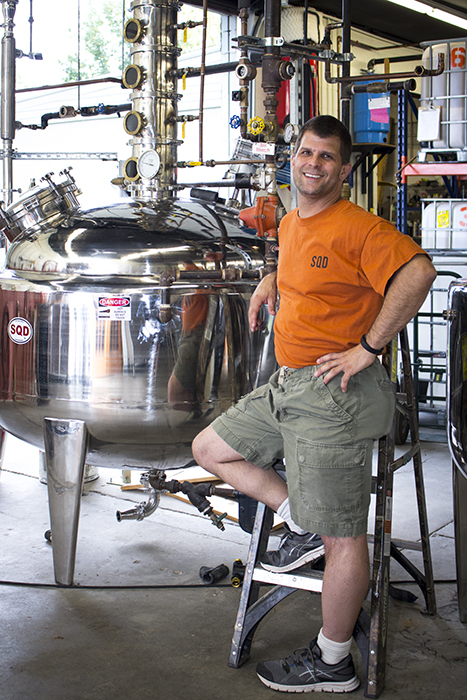 Kevin Kurland first considered making his whiskey mash with a cement mixer. He was that determined to fulfil a dream that was born in 2008. Back then, this veteran of the Iraq war had been stuck in limbo waiting out rocket mortar attacks when he glanced at a copy of the Wall Street Journal that extolled the growing trend in micro distilling. “That sounded a whole lot more fun than what I was doing at the time,” he says. After returning to the States, Kurland visited many distilleries, read dozens of books on distilling and enlisted his brother, father and uncle in the new enterprise — Smoky Quartz Distillery — an homage to the New Hampshire’s state mineral. A few bank loans later he found a 1971 warehouse on Lafayette Road in Seabrook and acquired a cook pot from a former jam and jelly operation — which happily negated the need for a cement mixer. He set up his father and uncle, former steam fitters, to run all the piping necessary to heat the mash and distill the brew. 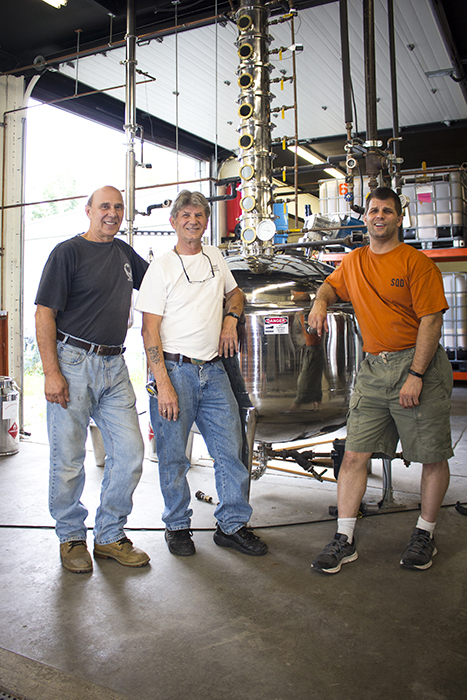 “We are just five vets working together now, “he says, “including my brother Frank who is working on distribution in Oklahoma” and his step-father, Dean Loomis, the distillery’s electrician. Vodka is the easiest spirit to distil and the team’s first, Smoky Quartz Vodka, was released in May of 2014. A moonshine followed in midsummer of that same year and the rum was bottled in March of 2015. Bourbon, former moonshine that has been aging in small oak barrels, will again be available this fall. His first batch quickly sold out. Kurland is making most of his products out of #2 dent corn grown and milled in New England. “I try to source locally when possible. It’s an important part of the process for me,” he adds. The corn is the fermentable for his vodka as well. He distils it to taste: “I don’t feel it’s necessary to tout how many times it is distilled; I just run it through the column until it tastes good to me. Vodka is supposed to be devoid of character, but a tad of sweetness from the corn comes out in mine.” He confesses that his vodka is right on the border of the definition. For tastings, he serves it chilled, straight from a freezer. Corn is the traditional fermentable for moonshine. Kurland simply adds bottled Monadnock spring water and barley malt enzyme to get the process going in the cook pot. When cooled, yeast is added and the brew sits five days while it ferments. Bourbon is as simple as that. It’s merely moonshine that has been colored and flavored by new oak barrels over time. Kurland naïvely tried to get his barrels from Tennessee or Kentucky, but the Yankee was told none were available. He eventually found a cooperage in Wisconsin. His barrels are given a #3 char, which Kurland chose so as to not overwhelm the flavor of his bourbon with heavy oak or smoked oak notes. Owner Kevin Kurland’s father Frank Kurland Sr. (right) and uncle Ken Kurland, both veterans and former steam fitters, ran all the necessary piping for the distillery. Kurland explains that while the moonshine/bourbon sits in the casks, atmospheric pressures and temperature changes force and release the fluids in and out of the wood. With each journey, they pick up a little more nuanced character. Indeed, on used barrel stays, the sugar line, or depth of penetration, is apparent. Since Kurland uses small barrels, the wood/bourbon ratio is higher and aging time is reduced. He bottles his bourbon after 10 months in wood, if deemed ready. For rum, Kurland uses a Louisiana molasses, heat and champagne yeast. The dunder (mash) is distilled once and then either bottled for white rum or aged for añejo rum, which is aged in their own used bourbon barrels for three and a half months. Once empty, local beer brewers are happy to use them one more time to age and add depth to their beers. 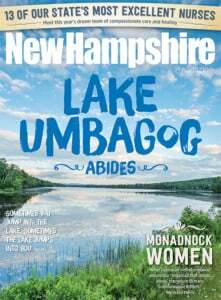 Many Smoky Quartz Distillery products are available at most New Hampshire Wine & Liquor Outlets (or you can ask your nearest store to order them), but a select few are only available at the Seabrook distillery. Tastings and sales are available seven days a week from 12 to 7 p.m. Tours run at the top of the hour, Thursday through Sunday, 12 to 7 p.m. In the future, Kurland has plans to use other grains for a rye whiskey and make a herbal gin. In October there was a Oktoberfest on the grounds with profits going to Wounded Warriors of 45 North. With strong family ties and a heartfelt desire to help other veterans and be part of the community, he isn’t forgetting his roots as he lives his dream first conceived with bombs bursting in air. Bless the land of the free and the home of the bourbon. Makes: General John Stark Vodka, Karner Blue Gin, Flag Hill White Rum, Flag Hill Spiced Rum, Josiah Bartlett Barrel-Aged Apple Brandy, Graham’s Grappa, White Mountain Moonshine and a variety of liqueurs. Their bourbon will be released on November 7. Makes: Apiary Gin, Tamworth Garden Eau de Vie, Art in the Age flavored vodkas, Tamworth White Whiskey, The Good Reverend’s Universal Spirit, Tamworth White Mountain Vodka, Art in the Age Barley Vodka and more. Read all about the distillery here. Distilled products coming in 2016. Visit nhcraftspirits.org for a map to distilleries. Most are open for tours and tastings.